You may have heard of “Angel Flight” before– it’s a network of organizations that provide no-cost transport for critically ill patients using airplanes. There are lots of variants of this basic idea; for example, the Corporate Angel Network provides transport using corporate jets to cancer patients, while Angel Flight Soars covers patients with all sorts of needs but mostly in the southeastern US. These organizations are matchmakers– they accept requests from patients and then match them to pilots who have volunteered. They coordinate transport but that’s it; the actual legwork of getting the patient from point A to point B is handled by the volunteers. Even before getting my pilot’s license, I knew that these organizations existed, and as soon as I got my license I wanted to start flying these missions. 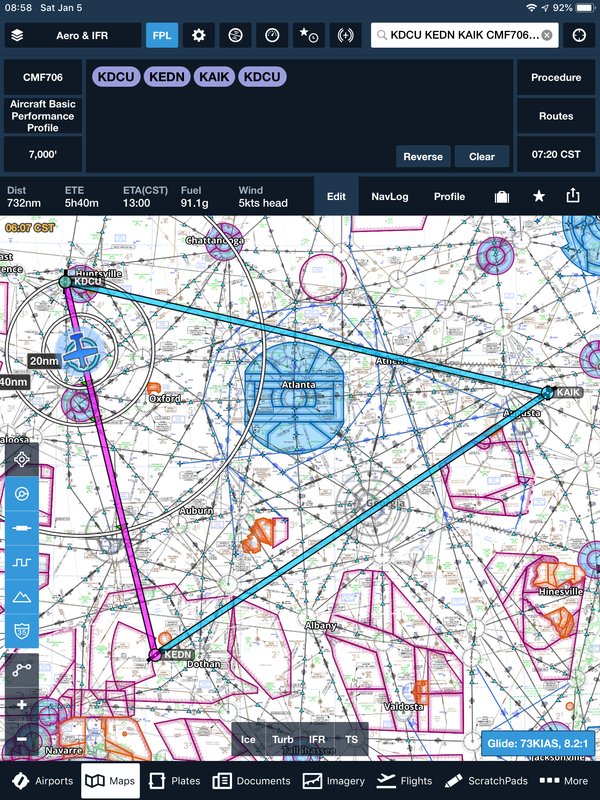 They typically require 250 hours of pilot-in-command time and an instrument rating, so it wasn’t until late 2014 that I met the requirements, so I registered with Angel Flight Soars and then… well, I just never got around to it somehow. I signed up for one mission that had to be aborted due to weather, but that was as close as I came. Angel Flight Soars maintains a list of missions that you can look at at any time, but their coordinator (hi, Bernadette!) will sometimes send out email looking for volunteers. This usually happens when they have confirmed pilots for some, but not, all of the legs of a multi-leg trip. Last Wednesday, I got an email saying that a volunteer was needed to ferry a two-year-old boy named Dawson from Enterprise, Alabama to Aiken, South Carolina. 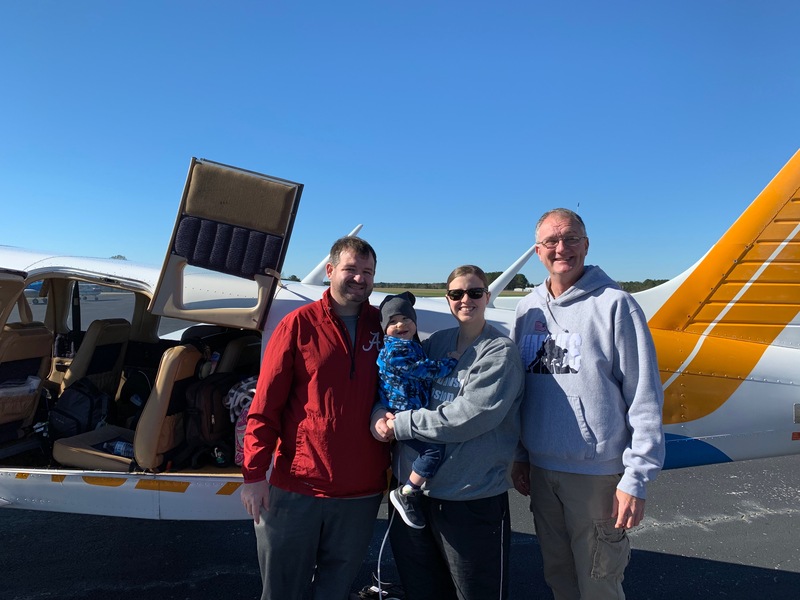 Angel Flight had already booked three additional legs to get Dawson from Aiken to Boston, where he was scheduled to have life-saving heart surgery… but if they couldn’t find a pilot for the Saturday Enterprise-Aiken leg, his family would face the exhausting 21-hour drive from south Alabama to Boston. The timing looked good; the airplane was up, I had a free day, and Matt was going to be at work, so I signed up and started planning my flights. I’d planned an 0730 departure, with roughly a 90-minute flight to Enterprise, a two-hour leg to Aiken, and then home.Angel Flight Soars had sent me a roster with all the information about the passengers and the ongoing flight legs. Dawson would be traveling with bottled oxygen, an oxygen concentrator, and a car seat, plus his two parents– around 500lbs of people and gear all told, well within the capability of my airplane. 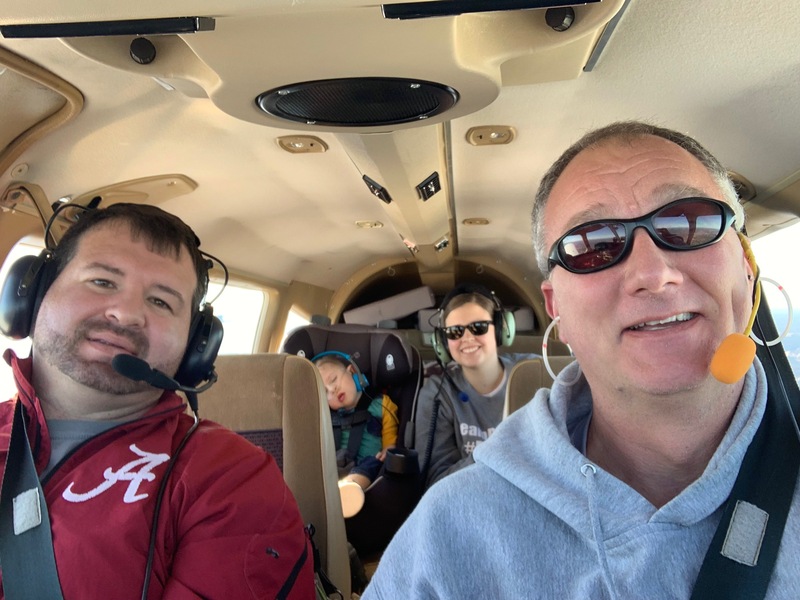 I called Dawson’s dad and the pilot I was meeting in Aiken to coordinate and give them my estimated arrival and flight times, then called North Alabama Aviation to ask them to fuel the plane and get it on the flight line. The weather was forecast to be clear and sunny, with an AIRMET Tango for moderate low-level turbulence. This last is worth a bit more explanation– AIRMETs define a polygon (usually really weirdly shaped) within which the forecast conditions may occur. Think of a tornado or hurricane watch– an AIRMET Tango means that there may be moderate turbulence within the area, not that there will be. Most of the time, this turbulence is at lower levels and is stronger closer to ridges, mountains, and so on; I didn’t think it would be an obstacle for this flight. Saturday morning, all ready to go, I got to the airport and sad reality intruded: the FBO hadn’t pulled out the plane, and they didn’t open until 8a on Saturdays, so I was late leaving. Once I was up, this is what it looked like. The flight to Enterprise was perfectly smooth with about a 30kt tailwind– always welcome. That cut my time to Enterprise down by a good margin and helped make up somewhat for my late departure. The Enterprise airport had the lowest fuel price of any of my stops, so I wanted to fill the plane there– that would minimize the overall cost. I filled the plane and met Dawson and his family inside, had them fill out the required waiver, and then started moving the show outdoors to load the plane. It was disconcerting to see such a small child with a nasal cannula and an oxygen supply– it really drove home his need for safe and efficient transport to his surgery. Honestly it was a bit daunting; normally I’m traveling somewhere for fun, and a delay or interruption is much less critical. The biggest bag went in the nose baggage compartment; two small oxygen cylinders and two smaller duffel bags behind the rear seat, then Dawson (in his car seat) and his mom in the back row and his dad up front with me. Dawson was surprisingly cheerful throughout the whole process. Takeoff was normal; it was a little bumpy until we got above about 4000′, then smoothed out nicely. Dawson fell asleep probably 30 minutes into the flight, and the rest of us enjoyed a quiet and sunny trip and an easy approach into Aiken. The airport there is quite nice, and obviously targeted at corporate customers who come into town for the Masters Tournament at Augusta. I didn’t take a picture, but one area of the FBO is all done in what I imagine the designer thought of as an English dinner club, with tons of dark wood, a 12′ tall fireplace, and so on. 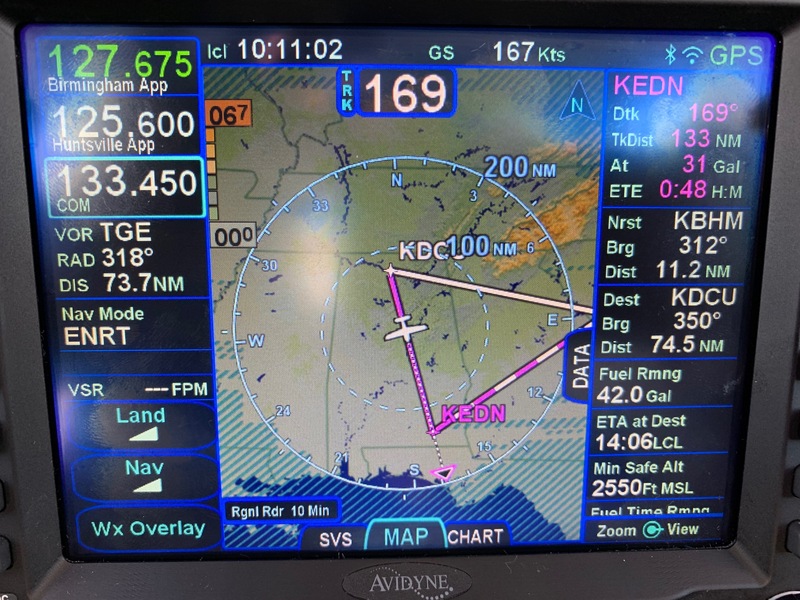 Like most other FBOs, the one in Aiken offers a fuel discount for Angel Flight missions, which I happily took advantage of– but even though there wasn’t a discount at Enterprise, fuel there was still cheaper than at Aiken with the discount. That 12′ fireplace wasn’t free, you know. At Aiken, we met Mr. Dale, the gentleman who was going to take Dawson on the next leg of his trip. We visited briefly, paused for a group prayer, and loaded up Dale’s Cessna 182 with all the gear. While I paid my fuel bill, they strapped in and taxied off, northbound on the next part of the trip; I then loaded up and flew home, enjoying the sunshine and pondering my good fortune. It was a moving experience all around– I received a very nice thank-you note from the family, but more than that I was able to contribute in some small way to helping a gravely ill child, while at the same time indulging in an activity I love. Summary: I’ve already signed up for two on-call missions to fly transplant patients (one from Pensacola to Birmingham, one from Decatur to Atlanta), and I’ll keep the plane gassed up and my flight bag packed… just in case. Very kind of you, awesome that there are people that do this.